Dave Attaway, member of St. Luke’s United Methodist Church, carries the cross for the Service of Remembrance and Celebration of Hope during the Council of Bishops meeting. United Methodist bishops must be accountable not only to United Methodists in their areas but also to the full Council of Bishops, asserted the council’s new president. 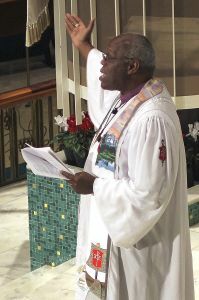 Bishop Warner Brown Jr. concluded his first address as the body’s president by asking his fellow episcopal leaders to affirm the vows they took when they were consecrated as bishops. The bishops stood in unison to show their assent. Brown, who also leads the San Francisco Area, spoke to a group that included 64 active and 43 retired bishops from around the globe. The council is meeting as the denomination is struggling with declining U.S. membership, deep divisions regarding homosexuality, and questions of what it means for church leaders to be accountable. 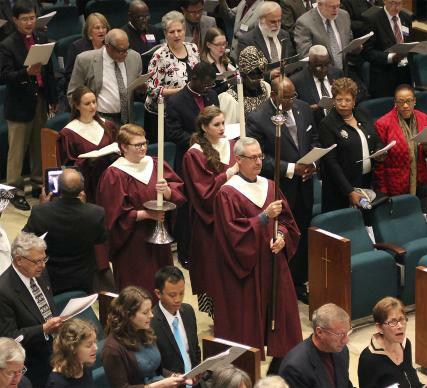 A group of United Methodists have argued that the church should split unless clergy who violate the denomination’s ban on same-gender weddings are held accountable. That includes bishops. Bishop Warner Brown Jr., president of the Council of Bishops, presides over Communion at St. Luke United Methodist Church in Oklahoma City. Photo by Holly McCray. Brown offered a broad understanding of how bishops should work together, including “not a looking over one another’s shoulder to second guess” each other. For years, bishops have discussed how they can hold each other accountable for effectiveness in ministry. Many of those discussions have focused on how they can help each other increase the number of vital United Methodist congregations and nurture both love of God and love of neighbor. Before the 2012 General Conference, the council approved a motionto have its executive committee develop a way to measure accountability. That is still a work in progress. Brown’s address also came almost a year after the council’s last meeting when the body requested a formal complaint be filed against retired Bishop Melvin G. Talbert after he officiated at a same-gender blessing in violation of church law. Talbert stood with all other bishops to reaffirm his vows. He and Brown are both part of the Western Jurisdiction, which is now handling the complaint. Talbert said Brown gave a good address, and added that he believes he has personally lived "an accountable life." The dispute remains a difficult one for bishops. After lunch, the bishops convened in a closed-door session to discuss human sexuality. Brown cited a survey by United Methodist Communications that found church members overwhelmingly do not want a split. He told his fellow bishops that as leaders of a church as “diverse as ours, we need to let people know we hear them.” That includes people in the majority and the minority, he said. Zimbabwe Area Bishop Eben K. Nhiwatiwa agreed. “What the church is facing right now is that we need leaders of encouragement, leaders who know leadership means addressing very hard issues, not evading them,” Nhiwatiwa said. He was hopeful Brown could provide that kind of leadership. As his fellow bishops stood, Brown prayed over them. Hahn is a multimedia news reporter for United Methodist News Service. Contact her at (615) 742-5470 or newsdesk@umcom.org .